Accessibility requirements for fire station renovation or new construction changed significantly when the Texas Department of Licensing and Regulation’s (TDLR) 2012 Texas Accessibility Standards (TAS) became effective on March 15th of this year. While Texas standards have always adopted federal ADA requirements, previous versions have included exemptions from some accessibility requirements for fire fighter (employee) only spaces. The previous exemptions are not included in the current 2012 TAS. As with most building code and accessibility requirements, the new requirements are not retroactive and only apply to new or altered facilities. An accessible path must connect public transportation and parking to the building entry, public-use spaces and restrooms. Public spaces include lobbies, public restrooms, treatment rooms, training/meeting rooms, kitchens, dining rooms, day rooms, and office areas. The remaining bedrooms and restrooms, along with spaces used exclusively by fire fighters, like the Apparatus Bay or support spaces, must merely be adaptable. This means they must comply with TAS requirements for approach, entry, exit and maneuvering, but all the accessibility equipment, like grab bars, is not required. Clearance between all opposing base cabinets, countertops, appliances or walls within kitchen work areas shall be 60” minimum. This means a u-shaped kitchen with a center islands requires a 60” clearance around three sides. At least one 30” wide and 34″ high section of counter with knee space below must be adjacent to the oven (typical counter tops are 36″ high). For combination range/ oven units with a parallel approach, the knee clearance requirement does not apply. At least 50% of the storage in the kitchens and pantries should be base cabinets or open shelving complying with clear floor space and accessible reach requirements. This may inflate enclosed kitchen pantries beyond a reasonable size to accommodate a 5-foot wheelchair turning radius, especially if a refrigerator is inside. One kitchen sink must have a knee space below allowing a maximum 5″ deep basin. This typically means a second deeper sink is installed for dish and pot washing. Combination refrigerators and freezers shall have at least 50% of the freezer space below 54”. Side-by-side or bottom-freezer refrigerators satisfy this requirement best. Clear floor space is required adjacent to the dishwasher door with no obstruction from the open door. Appliance controls require one hand operation with no tight grasping, pinching, or twisting of the wrist more than a 5 lb. maximum force to activate. At least one bedroom must be accessible, meaning that a 5-foot wheelchair turning radius, along with proper floor clearance and reach ranges are required at wardrobe units and exit windows. A 60” x 56” minimum floor clearance is provided at water closets. Lavatories must be a maximum 34” high and have knee clearance. Shower compartments must be a minimum 36” x 36” with a 36″ by 48″ adjacent floor space. Shower spray heads must be a hand-held type. Showers shall have a maximum 1/2” high threshold. Grab bars at water closets and showers, along with seats at showers are not required, provided reinforcing is installed in walls. TAS (and ADA) doesn’t require non-occupied spaces, such as mechanical/electrical rooms, elevator pits, equipment rooms, crawl spaces and catwalks to be accessible. Storage spaces, such as closets and janitor rooms, may or may not need to be accessible, depending on their size. Storage spaces used by non-fire fighting personnel must be accessible. Another significant impact from the 2012 TAS is that two-story fire stations now require an elevator, even if only used by fire personnel. 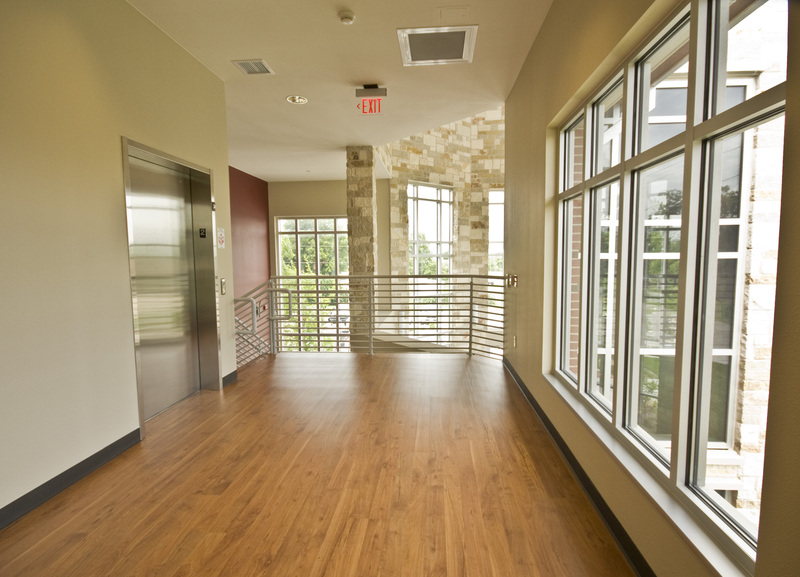 A second floor will typically also require two exit stairs per the building code. Accessible parking must be located on the shortest accessible route to the building entry. Exterior accessible routes (sidewalks) may not exceed 5 percent slope in the path of travel with a maximum 2 percent slope across the width of the travel path. If the slope exceeds 5 percent, it is considered a ramp and requires handrails on both sides and level landings at the top and bottom. Interior accessible paths (corridors) require a minimum 36-inch clearance width, but may be reduced to 32 inches for doorways without doors or cased openings as long as restrictions are no more than 2 feet in length. A wheelchair requires either a 5-foot turning radius or a “T” shaped turn-around. Doors typically require an 18-inch adjacent clearance to the pull side of the knob and 12 inches of clearance on the push side. For a more in-depth discussion specific to your situation, please send Gary DeVries an email at fire@brwarch.com.